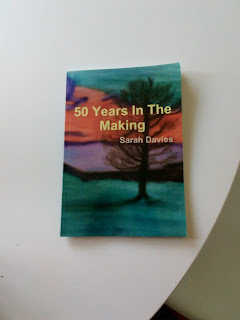 My short story 'The Letter' appears in "50 Years In The Making" and is probably more accurately described as a piece of flash fiction, a genre I love because it's short and to the point. The point of this story is simply that a man receives a letter that changes his life, that's it. People have commented that you never actually know what the letter is and that can be a bit frustrating. When I was writing, I had in my mind those really important life-changing letters I've received in the past... The one that told me I was cancer free, the one that was my Decree Absolute, the ones that give the results of smear tests and mammograms... All these really important letters come on cheap, shiny paper and are often printed or photocopied at a weird angle, so whilst they can massively impact on your future they also look far less impressive than they should. Whilst the character in the story is male (I don't know why that's just what appeared on the paper when I sat down to write), the house is mine, my brother did buy me a selection of coffee one Christmas, I do have an IKEA doormat that has never yet been replaced and I do cook my brioche rolls that way (but my mum isn't in to flower arranging). He could see it as he came down the stairs, a white rectangle on the hall mat he’d bought in IKEA as an “it’ll do until I find the perfect one”, five years ago. He walked past it. He’d leave it until after breakfast, no matter when he opened it, the contents would still be the same. There was no rush. He switched on the kettle, selected his favourite mug, opened the cupboard and ran his finger along the dozen boxes of coffee his brother had bought him for Christmas. Would he choose strength 1 ‘gnat’s piss’, or 5 ‘eats the spoon if you leave it in too long’? He compromised on 3 ‘strong enough, but you can still concentrate on work’. Brioche rolls, 30 seconds on high in the microwave. Trial and error had taught him the optimum time to make them soft and release their sweet, creamy odour. Too long and it was like eating a piece of that green oasis stuff his mother had used when doing flower arranging. Too much butter for the brioche and a splash of milk in the coffee and he moved to the dining room. He saw the rectangle again as he walked through the hall. It called to him softly, but he pretended not to hear. He sat, gazing out at his garden; soon it would be warm enough to eat breakfast outside. He’d have to buy that table he’d been promising himself. A slightly insistent tugging at the base of his skull reminded him that the rectangle was still on the mat. He thought of other things. He went back to the kitchen, made another coffee and thought about his day. The calendar on the wall was comfortingly blank and he knew his diary only said one thing. Scrawled across today, in red capital letters was “UNTOUCHABLE”. He’d put the whole day aside to write, there would be no phone, no computer, just his pen and the yellow legal pad he favoured when he was doing a first draft. The tugging at the base of his skull was annoying now. He took a clean knife from the drawer and went to get the rectangle from the mat. It sat there looking like a reflection of the closed front door. He snatched it up and slit it open with the knife (a habit he’d picked up from his father). He saw doors opening and others closing in his mind’s eye; new paths and new ideas forming. He tucked the letter back into its envelope and walked to his study, after all today he was untouchable.